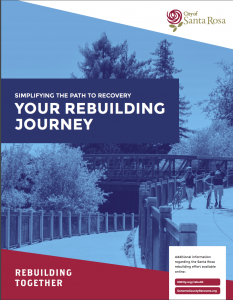 Santa Rosa has a Dedicated Rebuilding Center! 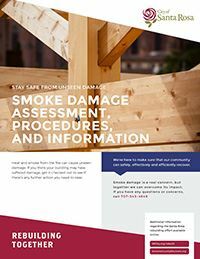 NOTICE: Priority staff time is given to property owners who have lost their homes or business. If you are a real estate agent, developer, investor, or other such party, please make an appointment to get your questions answered. Appointments are limited to 15 minutes and can be scheduled from 8:30am to 11:30am Monday through Friday by calling 707-543-4649. What is the Resilient Cities Initiative? 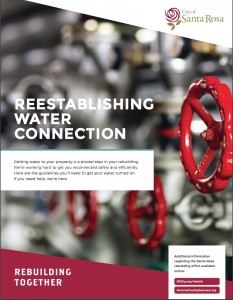 as possible, measures have been put into place to assist property owners, and to ensure that repair and reconstruction of damaged and destroyed structures is both efficient and expeditious. 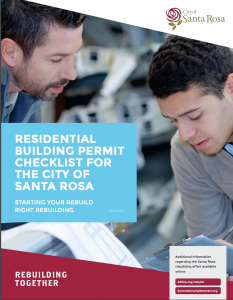 The proposed Resilient City (-RC) combining zoning district is applied to properties within the City of Santa Rosa limits that were most impacted by the Fires of October 2017 (see maps below). The district is combined with the primary zoning district in place for each property. 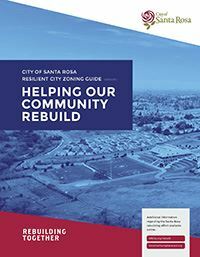 For example, a property within the impacted area that is currently zoned Single-Family Residential (R-1-6) would be zoned Single-Family Residential-Resilient City (R-1-6-RC). 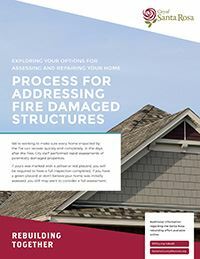 The -RC combining district provides for streamlining of the permit process and expedited review for reconstruction and repair of damaged or destroyed residential and non-residential structures. Also included is waiving of the discretionary planning permit fees, as well as fees for demolition permits and temporary housing. In addition, the -RC combining district delegates the review authority of any required discretionary planning permits, such as Hillside Development and Design Review, to the Director of Planning and Economic Development. 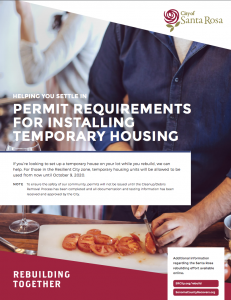 In order to provide an opportunity for property owners to live on site while their homes are reconstructed, the -RC district allows for temporary housing including trailers, recreational vehicles, manufactured homes, tiny homes and other similar structures. Further, the construction and occupancy of a new detached accessory dwelling unit (ADU) on site, prior to the construction of a single-family residence on the site, is allowed.